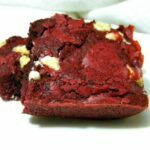 Moist and chewy red velvet brownies - tastes like the cake with that great brownie texture. Perfect for Christmas or Valentine's Day... or any other day of the year. Butter a 9 inch square pan. Cream the sugar, vanilla, and melted butter until smooth. Add the eggs, one at a time, stirring well after each. Combine the dry ingredients and stir into the butter mixture. Spread in the pan and bake 25 – 30 minutes. Take the brownies out of the oven when they are slightly underdone.